the stitched silhouettes against a bright full moon ! 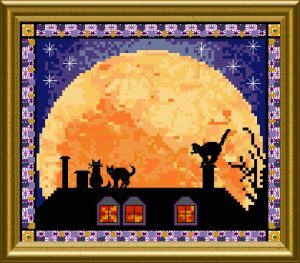 Arranged on a roof with lit windows and surrounded by a beautiful Special Stitch border, this is sure to give pleasure whilst stitching ! The mere design size is 92 x 78 stitches and yes, you see right: there are Purples in the border and dark and yummy Blues…. Beads and crystals will add to the night’s bling. I have 3 black cats, this one is perfect for me!